To Prep For Debates, Stand-Ins Take The Stage Both President Obama and his GOP rival, Mitt Romney, have spent weeks preparing for the debates by facing off against fake versions of their challengers played by stand-ins. Though easily overlooked, the work of a debate stand-in is grueling. 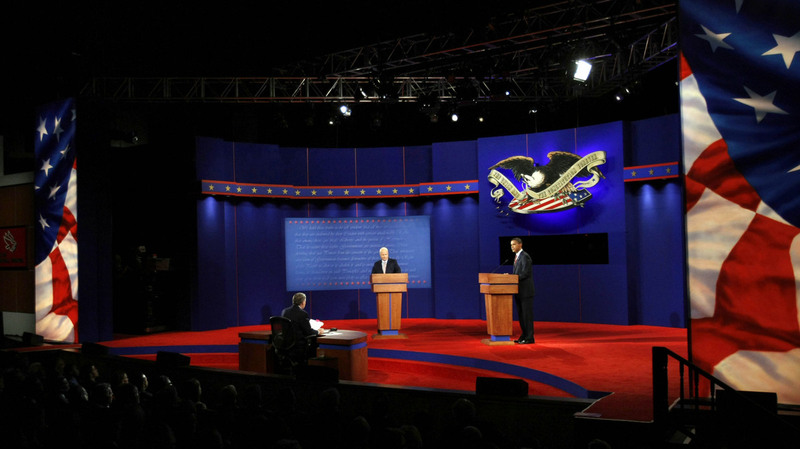 During the 2008 presidential debates, it was Ohio Sen. Rob Portman who stood in for Sen. Barack Obama when Sen. John McCain needed a practice partner. Portman is reportedly reprising his role this year for Gov. Mitt Romney. In Obama's corner, Massachusetts Sen. John Kerry will stand in for Romney. 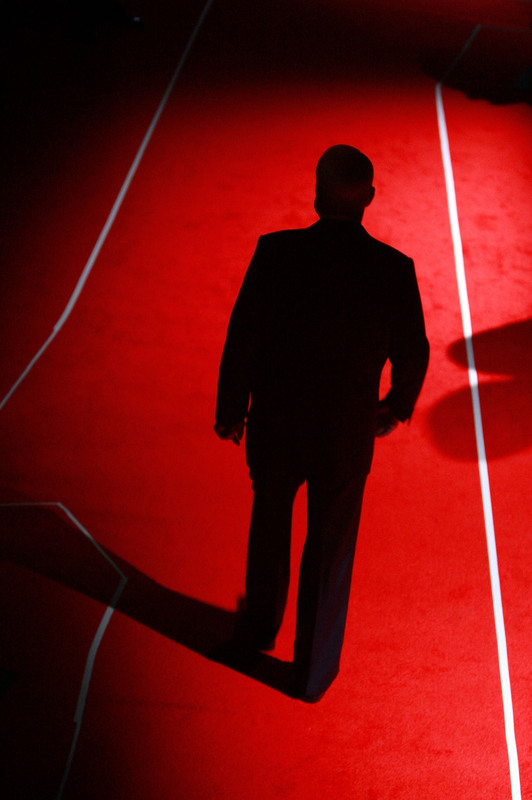 Republican presidential candidate Sen. John McCain waits backstage before the presidential debate with Obama in 2008. When President Obama and Gov. Mitt Romney stand on the debate stage this week, their campaign advisers and debate coaches want everything — from the stage lighting, to the audience, the room temperature and most importantly, their opponent — to feel very familiar. Both men have spent weeks preparing for the debates by facing off against fake versions of their challengers played by stand-ins. Though it is easily overlooked, the work of a debate stand-in itself is grueling. "It's an incredibly intense undertaking; I spent literally hundreds of hours," former New Hampshire Sen. Judd Gregg told Weekend Edition host Rachel Martin. Gregg played Al Gore in debate preparation for George W. Bush in the 2000 election. His counterpart that year was Democratic strategist Paul Begala, who was playing George W. Bush during Gore's debate prep. "It was a multi-week commitment, where it was pretty much the biggest thing I did," Begala says. In order to properly play their roles, Begala and Gregg started reading, listening and watching as much as they could about the men they would pretend to be on stage. "[It] got to the point where my wife no longer wanted to turn on the car radio, I had so many tapes of Al Gore in it," Gregg says. There were times, however, when all that research and preparation paid off. Gregg says that they realized that Gore, because of his physical size and character, would at some point try and walk into Bush's space during a debate. So when it happened in their third debate, they were prepared. Host Rachel Martin talks with NPR's Scott Horsley and Ari Shapiro, who have been on the trail with the Romney and Obama campaigns. "He looked at me and smiled, and in a relaxed way went on with his answer," Gregg says. "I happened to think that was one of the turning points in the election, and it was interesting that it happened exactly as we'd scripted it." But you can only script so much. Begala says this was true of Gore's performance. He says what the media picked up on was Gore's breathing pattern, in particular his audible sighing in the first debate. "He really was appalled at notion that [Bush] was one step away from the White House," Begala says. "At least that's the sense I got." It was something Begala didn't notice, though he wishes he had, in the debate prep. Begala and Gregg have played the game of politics for a long time. They both said, often, debates are won or lost in the prep. "It comes down to the candidate making a connection with the audience in a comfortable way," Gregg says. "It gives the audience two reactions: one that they like the person; and two, that they see the person as a leader." And to do that, he says, you have to spend a lot of time preparing.